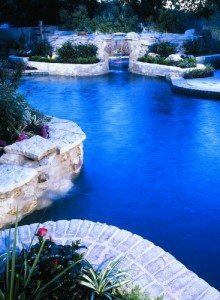 Concrete pools offer the ultimate in personalization and customization. There is no limit to the features and designs available. You can have a “traditional” or “formal” style such as a Grecian or Roman pool, or you can have a “jungle / lagoon,” or anything in between. We can design something “simple and budget-friendly,” or we can create a “total backyard experience” – whatever is right for you. Concrete swimming pools are built onsite by necessity because concrete has to be poured into a hole, smoothed, and then allowed more than a week to firm up completely. Before the concrete is poured, a hole is dug and a framework grid of rebar is assembled and put into place. This onsite installation makes it easy to design the shape, size, and contour of your pool to fit your needs and property’s aesthetic. Concrete pools are especially important for those with unique space limitations to their property. Some pre-fabricated pools just won’t fit in your backyard, and making them fit so save a few extra dollars can create an eyesore. Call us today and let’s schedule a time to review your dream list for your new pool so we can ensure that your pool ready for use and is the centerpiece of your family’s summertime enjoyment for years to come.